Every individual who served in the Divisional Cavalry is a hero. We are dedicated to honouring the lives of every trooper, NCO, and officer. We are proud of those who won awards for selfless courage and gallantry in action. But here, we remember people from across the regiment, who were special in some way, big or small. Some received recognition for their service, and some did not. Some were written about in the history books, most were not. Some, like Barbara, Lady Freyberg, wife of General Sir Bernard Freyberg, GOC the New Zealand Division, were friends of the regiment. Lady Freyberg cared deeply about every New Zealand soldier, none more so than those being treated for their wounds in hospitals in Cairo, including DivCav members. Click on the photo to learn more about these amazing individuals and who they were. 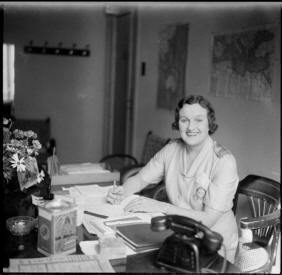 Lady Freyberg, wife of General Sir Bernard Freyberg, in her Cairo office. She led the 'Tuis'. 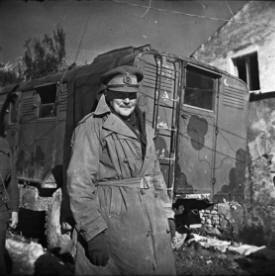 Coming soon -- the New Zealand Division's great leader Lt.-Gen. Sir Bernard Freyberg, VC.